When Kevin Porter left school at 16, he joined the Royal Navy to gain new exciting experiences and to travel the world. But it wasn’t long before he found himself fighting in the Falklands war at 18 years old in 1982. It gave him a different outlook on life, some of which were positive and others that were not. The effects have been with him through his life since but has more recently found a way of using all those experiences to positively change his own life, as well as others. He returned to his small hometown a hero, but soon gained a reputation he’d sooner forget. And although it took him many years to recognize, he’d been suffered from PTSD. With the help he eventually benefited from, he also trained in order to similarly help others. He has since helped other people dealing with the same issues he did, as well as helping them to overcome medical problems and to give people the confidence to grow their businesses and generally aim higher in their lives. 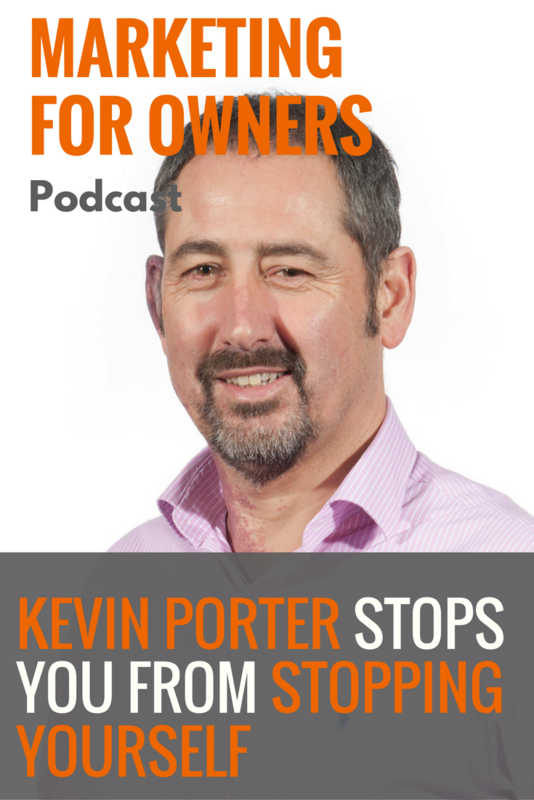 Kevin talks openly with us about what he’s been through as well as what he’s doing now in order to help his clients. Being from Millom, a small town in Cumbria, he was already known before he joined the navy, and when it came to fighting in the Falklands, he was the only resident in the town to go. That meant when he returned, he was feted as a hero, and they even held a street party to commemorate his return. Being known as the hero meant he rarely had to pay for his own drinks either. As a result, every time he returned to visit his family, he would end up getting very drunk. It was on one particular night that he found his reputation tarnished. Vowing not to drink, he later found that everyone had been topping up his drink without him knowing. And the next morning, he found himself in a shed in someone’s back garden missing most of his clothes. He was later arrested for smashing a window, of which he had no recollection of doing. Despite his dad advising him to mention in court that he’d been to war, Kevin didn’t want people to know that he wasn’t coping. And he wasn’t. The events came as a huge embarrassment to him, his family and those who supported him. He went from hero to being known as the drunk naked sailor who smashes windows. But that didn’t mean the town’s folk no longer support him. Of course, this was back in the days when PTSD (Post Traumatic Stress Disorder) wasn’t recognised. And so, when he left the Royal Navy, he continued to act in the same way, causing problems for his wife as he continued to drink heavily. He was always chopping and changing jobs, and he suffered from a lack of self-belief as well as anxiety. It took around 20 years for him to actually realise he wasn’t coping. And that’s when he eventually took himself to the doctors and fought to see a military phycologist. It was at the organisation Combat Stress – a Veteran’s mental health charity – that he was diagnosed with sub-clinical PTSD. Because of his ability to still function, and his motivation to improve himself, he couldn’t be diagnosed as fully having PTSD. It was when during a pilgrimage to the Falkland Islands that he met Graham, who was a veteran as well as an NLP coach and trainer, that he was able to put in place positive changes. NLP (Neuro-Linguistic Programming) was something Kevin had already used himself during his time working in commercial settings. And when they returned home, he went onto a training programme with them, as well as joining the practitioner’s course. To the team he brought along his commercial and military experience, helping them as they developed a course for those in the military. It was during all of this that he began to speak to Graham about some of his issues, and was given some tools to help overcome them. And these worked for him where counselling hadn’t, and it changed him completely. One stand out moment for Kevin was when he drank two bottles of wine one evening (a common occurrence), before cycling to and from a Pilates class on just four hours sleep the next morning, and feeling none of the effects you might expect. He knew then that something had to change. Since September 2014, he hasn’t touched any wine with the thought of it making him feel ill.
Another thing which Kevin has since been able to achieve is writing up his experiences in the Falklands War so that people don’t forget the sacrifices people made and how they suffered. Although he started in 2002, it was in 2008 that he started to really fill it out. Six years later in 2014, he’d managed to put together around 20,000 words. The process was a painful one, and therefore made progress slow. In a breakthrough session with Graham, he set himself the goal of completing the diary by the end of the year. On December 24, 2014, he completed it at a mighty 72,000 words. Kevin is now a professionally qualified hypnotherapist. His work has seen him assist trauma victims and anxiety depressives, as well as people within business who are looking for the confidence to enable them to change their lives. As a result, he’d helped businesses go through the roof and individuals to achieve higher wages. And it all works by changing the way their brains are wired up. There are many parts of the subconscious mind which cause issues, and hypnotherapy talks directly to that part of the brain. By doing so, he’s enabled people struggling with bad backs and those who have had strokes, to improve their physical wellbeing to the extent physiotherapists have been shocked. Of course, it helps that often the people who are approaching him are doing so because they’re already in a mental state which is willing to accept change. And once your subconscious has that confidence and your thought processes have been altered, it is a long-term change that will stay for as long as you want it to. With these fine-tuned, you can then set yourself a goal and have a clear vision of where you want to be. You have the motivation to drive yourself forward. If you’re constantly being told you can’t do something, or are putting yourself down, then it’s understandable that you won’t be able to achieve those things. By having the belief that you can actually do something, then you are able to actually succeed. In May 2017, Kevin will be publishing his diary of his time in the Falklands called First Time Shot In A Shell, about an 18-year-old boy at war. Connect with him on Twitter to be the first to find out when it has been released. And to find out further information about Kevin then visit his Transformational Hypnotherapy website. Also, please do get in contact with him if you too have been similarly affected, or if you’re looking for help with any other problems you may be experiencing.